Last time I taught you all sorts of incredible healthy ideas for breakfast, which I still feel is the most important meal of the day. Your energy for the entire day is determined by how you start your day. Lunch is critical too, so I do suggest putting some focus on this also very important meal. If you make this a significant meal, then dinner can be just supplemental and you will more easily be able to shed a few pounds. The reason for this is that your digestion is strongest mid day and you have the rest of the day and evening to burn off what you ate as opposed to ending your day with a huge heavy meal. So many people seem to struggle with making good choices for lunch. Often it is because they are too busy and will grab something quick and unhealthy at a fast-food joint. In the “What to Have for Lunch” series I recently completed on my new Janet McKee Fan facebook page (which is also shared across my other pages), I offered many wonderful and interesting suggestions. These are so great; they can be a choice for dinner too. CHOOSING A HEALTHY LUNCH DOES NOT HAVE TO BE COMPLICATED. 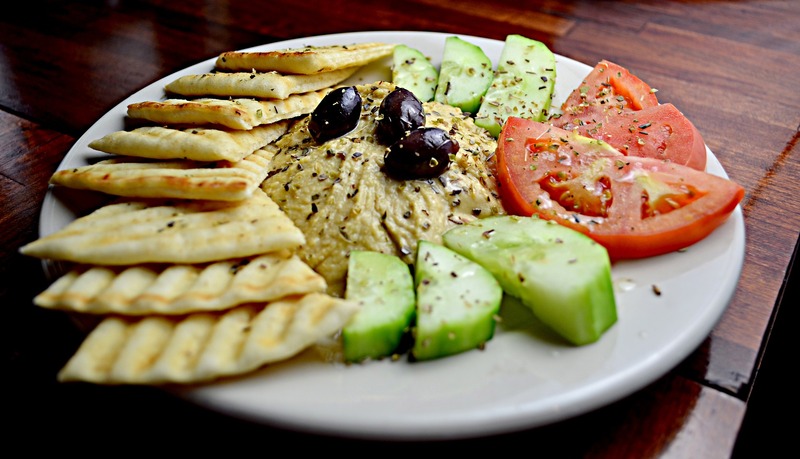 Try hummus and veggies for a quick, healthy, delicious and satisfying choice. You can buy hummus at any grocery store but if you want to make your own, try these simple recipes from PCRM: Hummus or Roasted Red Pepper Hummus. I love having all sorts of salads for lunch but so many people find eating a salad boring and therefore, not satisfying. Well, I teach people to SATISFY TASTES AND CRAVINGS IN A HEALTHY WAY! This is by far one of my favorite recipes; “CREAMY” TAHINI DRESSING (without the cream of course). This is a must try as I teach you WHAT TO HAVE FOR LUNCH for high energy and vitality all day long. To get this recipe and more ideas on how to live a successful and triumphant life, visit: Simple Tahini Dressing. Or, watch the following video on how I like to include it in my salad wrap! One of my favorites that I learned from Dr. Stan and Jayne Wetschler. This is a raw food recipe that gives you the taste and texture of cooked food, but with more nutrients than cooked. You can do this recipe with cooked wild rice instead of raw too, if you prefer. This is another idea in my WHAT TO HAVE FOR LUNCH SERIES as an example of the types of amazing ideas we share with our PREMIUM members of SanaView. Get the recipe at raw-wild-rice-pecan-and-cranberry salad and learn more about becoming a member by visiting: SanaView Premium Membership. In my “What To Have For Lunch” series this week (last week was what to have for breakfast), I’m covering all sorts of nourishing high-energy meal ideas so that you avoid the afternoon slump where you reach for the caffeine and sugar. I’m positive high energy all day long because of what I eat and how I live and I’m passionate about sharing these simple ideas with YOU. It is a rainy day today here and I need to do something with all of the tomatoes and basil from our farm, SanaView Farms. So, some soup with a fresh salad, all from the garden, is going to be wonderful! Get the recipe and more at tomato-basil-soup. P.S. I love to make large quantities of this and can it or freeze it to enjoy all winter long. There is nothing more amazing than enjoying the tomatoes and basil from the summer garden in the middle of the winter. I love soup for a healthy lunch but it simply is too hot for soup somedays. Did you know that you can make butternut squash soup RAW? This is actually super simple in a blender and is DELICIOUS and nutritious! We’re teaching you WHAT TO HAVE FOR LUNCH (since we just finished a week or so of what to have for breakfast)! Grab the recipe by clicking Raw Butternut Squash Soup Recipe. Of course, this is my all time go to soup recipe because I can put anything I got from my garden or local farmer’s market into this soup. And, when I’m inundated with broccoli from the farm, I will can it to enjoy all winter long. To learn my simple canning technique, see my video on my new Janet McKee Fan Facebook Page. Ok, you can’t discuss lunch ideas without including a burger option. Many shy away from veggie burgers and rightfully so because too many are dry and have no flavor. Well, this one is different. It is so good that the meat loving folks in my life LOVE this burger so much that they ask for it by name. Get the recipe by clicking here: Spicy Garbanzo Burger. Now, for the most exciting recipe of all! I know, many of you simply do not have time to be making all of these amazing foods when you are busy getting ready for work etc… So, the next two blog posts will cover HOW TO EAT OUT AND EAT HEALTHY and FAST FOOD THAT IS FABULOUS. If after all of this, you are still scratching your head on what to have for lunch, then please hop onto the High Performance Coaching bandwagon by visiting: Get Everything You Want Out of Life.